Here's another wonderful online slot game from Wizard. There’s a lot of mystery surrounding ancient Egypt from how the great pyramids were built to the circumstances of King Tut’s death. 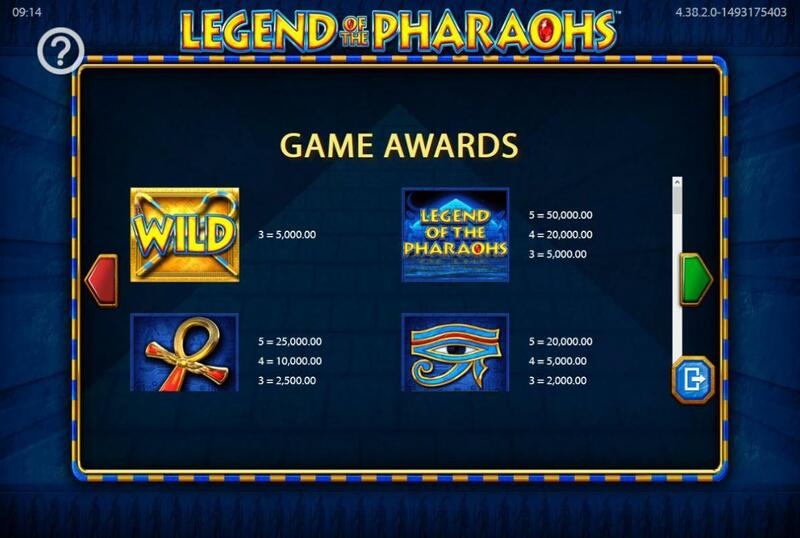 Legend of the Pharaohs delves into this ancient world, an online slot that offers great variance and win opportunities across it 5 reels, 3-row Gameboard. So let’s walk like an Egyptian all the way to a jackpot prize! Scientific Games (aka SG Interactive) have been around for decades through some savvy acquisition of legendary companies. Their suite of casino games includes many popular slots online from licensed titles like Monopoly Mega Movers to their own original titles. Find online slot games here created by Scientific Games. 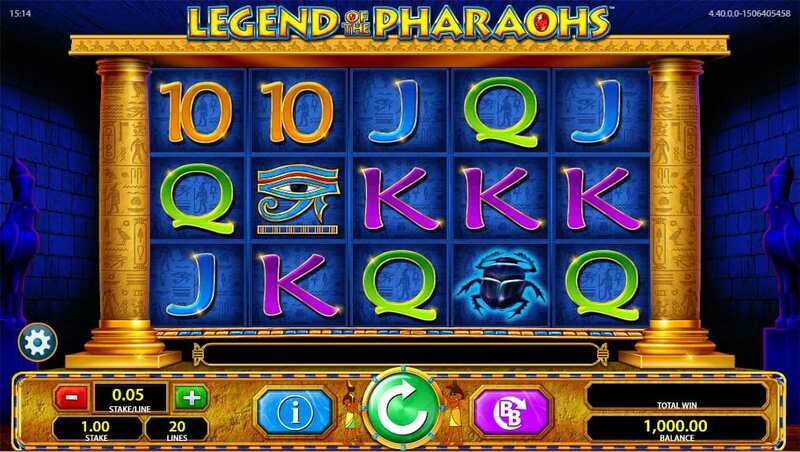 This online slot takes place deep within a tomb. The background is dark blue, casting shadows onto cold walls with Egyptian statues on either side. The Gameboard, by comparison, stands out as a gold temple, perhaps a monument to a long-dead pharaoh. Ornate decorations and Egyptian hieroglyphs are scattered across the pillars while inside, the 15 symbols are backgrounded in blue. Explore the ancient times when you try one of the best 3D slots today! 5 low-value symbols are lazily, but typically, modelled on a deck of playing cards: 10, J, Q, K and A. The high-value icons are more interesting, fitting into the Egyptian theme with ease. These are a glowing scarab, a terrifying red-eyed mask based on Horus the Egyptian bird god, the Eye of Horus, an Ankh, and most valuable of all, the title symbol. WILDS are two staffs crossing each other and these can score too with a match of 3. 2 SCATTERS are available, the blue and red pyramid. 3 or more blue pyramid SCATTERS trigger the free spins bonus, awarding 10 free spins with varying numbers of bonuses depending on how many SCATTERS hit. Spins can be retriggered in a free spins bonus whenever a red pyramid SCATTER lands. 1 bonus will be activated if 1 red pyramid hits, 2 bonuses for 2 SCATTERS and 3 for 3. WILD reels – These turn all positions on a single reel WILD. The reel remains WILD until the free spins round ends and further bonuses can turn further reels WILD. Win Eliminators – This bonus will eliminate a symbol from the round, starting with the lowest value symbol (10) and working its way up if the bonus is retriggered. This is great as fewer symbols on the board increase your chances of a match. Colossal symbols – This unique bonus turns a single symbol into one colossal 3x3 square that takes over reels 2 to 4. Finally, there is a Big Bet button next to the spin button, offering 4 options for high stake gaming to go for super and mega bonuses.